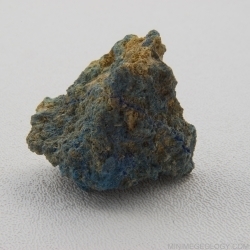 Azurite is a blue mineral that often occurs with malachite. Azurite has a pale blue streak, glassy luster and low to moderate hardness. This heavy, fragile mineral will fade to green malachite over time. An information card with details on the mineral formation, characteristics, and uses is included. Typical samples sizes are generally 1-2 inches in length or width but can vary based on availability and natural crystal shape.